The object of House of Words is to have the most points when the first player exits the House of Words. 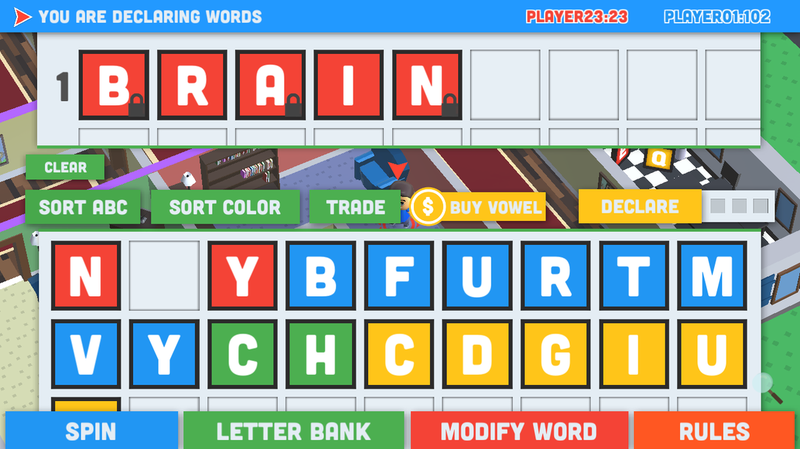 You get those points by forming words from the letters and blanks you collect (or trade) as you move from room to room around the house. Of course, you can only enter a room that has a door. There are a total of 8 moves you can make. Four moves are on the spinner and the other 4 moves are if you choose not to spin, including building words and trading letters with other players. Another move is the shuffle (moving the location of a door) by spinning a wall. It is the fun and exciting strategy of the game. You can even trap your opponent in a room. House of Words originated as a board game concept by Joel Cohen. Joel, founder of game publisher In, Out, and Shuffle About, had the idea to create a new word game for families, but one that had the additional strategy of racing to collect letters ahead of your opponents. After years of prototyping, including designing a unique 3-D game board with movable walls, the basic idea of House of Words was born. Joel, a proud Drexel University alumnus, reached out to one of the founders of Drexel's top-10 nationally ranked Game Development program, Dr. Paul Diefenbach. Paul helped match Joel up with former students in local game development companies and managed production.